How to get a list of all files in a folder on Windows 10 – Now Look Here! So let’s start. First up, you need to open the folder in Windows Explorer, and then enter a command prompt. This is what old-timey people call “DOS”, because it looks just like the defunct operating system that we used to use on our IBM PC’s back in the 1980s, when MTV played music videos, when bread was 10 cents a loaf, when children respected their elders and when dinosaurs roamed the Earth. To do so, right-click on the little Windows logo on the bottom right of your screen (In other guides, I’ve called this the “Start Button”, but apparently it hasn’t been called that since Windows XP. Which dates back to 2001. I’ve got some old habits.) When you right-click it, whatever it’s called now, a nice long menu will pop up. Helpfully, the good people at Microsoft have NOT put this list in alphabetical order. Look for “Command Prompt” and click it. Like magic, the correct path to the folder will magically appear. Magic! Click back on the command prompt and hit Enter. Only one step left: In the command prompt, type “dir /b > file_list.txt” and hit Enter (if it doesn’t work, try copy&pasting that command into the command prompt window). 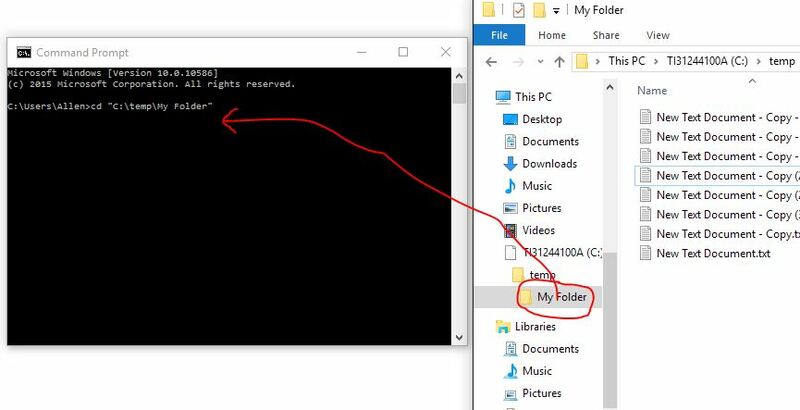 You can close the command prompt, and go back to the folder in Windows Explorer, and you’ll see that there’s a new text document waiting for you called “file list”. Double-click that file to open it, and you’ll see everything in that folder listed in alphabetical order. You can now edit it, clean it up, remove the names of sub folders, and do whatever else you want with the list. Save, exit, and the job is done! Although this guide is written for Windows 10, it should work with earlier versions too. It *should* work as is with windows 8, windows 8.1 and windows 7. The drag&drop might not work in Windows XP though – I’d normally have tested it but honestly, XP is so old I wouldn’t even know where to find a working copy, outside of the local computing history museum.